If you've ever wondered how paper gets recycled, find out for yourself by turning your used, unwanted paperwork into fresh homemade paper that you can use again. Any type of paper can be recycle, whether it's used computer paper, paper grocery bags, or old flyers. Using a blender, a coat hanger, pantyhose, and an iron, you can convert your ripped up scraps of paper into a new sheet that you can use as stationary or greeting cards, or you can go a step further and make many pages for your own completely recycled notebook or journal. If you have a lot of fabric scraps, you can follow a similar process to upcycle your unused fabric into cloth paper. Simply soak fabric scraps for 30 minutes before adding to blender to create a mushy cloth pulp, then continue as if making paper from paper scraps. 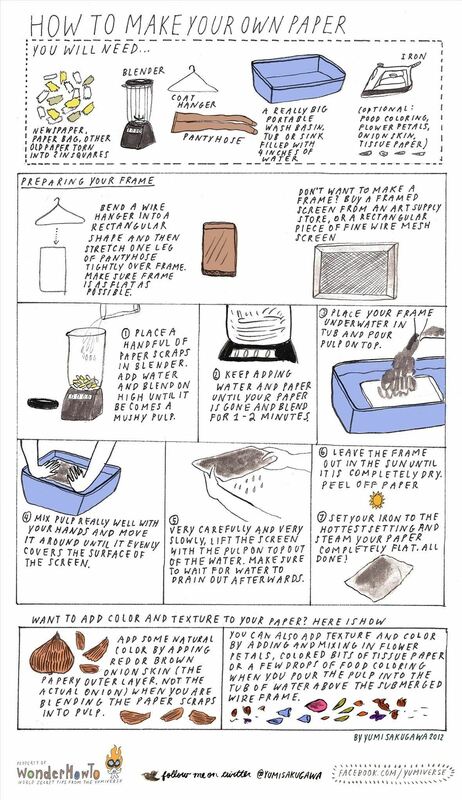 Take note: making your own paper can be a very wet and messy process, so have a lot of space to work with and extra towels on hand. You have been warned. Have you made your own paper before? How did it turn out for you? Share with us by commenting below!